-Hanaya- brings you an original mesh reconstruction of an iconic house – single residential build with a land impact of only 16 PE, and provided size of 22 x 37 meters. The build is a scale reproduction of a famous house built in the late 1940s. It is based on architectural plans that are publicly available from the United States Library of Congress. To learn about the house, please visit http://en.wikipedia.org/wiki/Farnsworth_House for a starting point. The textures include materials, with the exception of glass surfaces. This will provides a 3 dimensional feel to the building elements when you have the Advanced Lighting Model and shadows enabled in your viewer. The house contains a texture change menu for the window and door glass as illustrated in the following images. The inside and outside windows can be set separately, so if you wish, you can have complete privacy from outside (closed) and still be able to see outside when you are in the house. To access the Texture Change menu, simply touch the front windows or door. Diagramatic instructions with screen shots are provided in the package, along with an extra set of stairs. A version of the house with ground shadow is also provided for those who do not have shadows enabled in their viewer by default. To help you envision how furniture might look in the house, a furnished model home is on display at -Hanaya- in-world store. Feel free to try everything out. 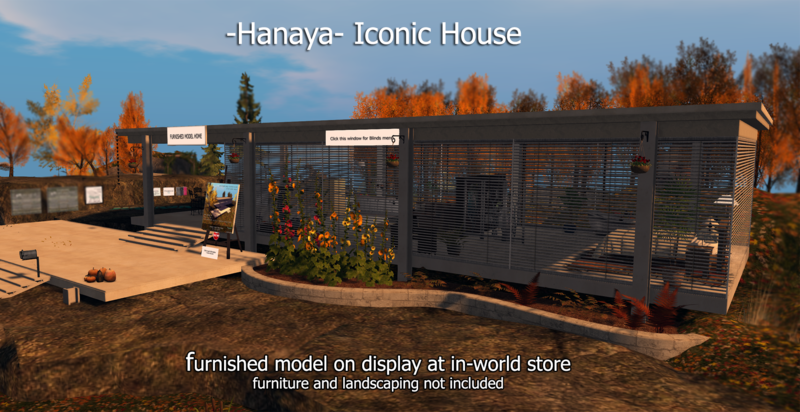 To purchase the -Hanaya- Iconic Glass House, either buy it in-world or on the Second Life Marketplace. A footprint demo, as well as information about how the house works is available free of charge. This entry was posted in Product Announcements on November 27, 2014 by moriko.